Digital Subscriber Line (DSL) is a perfect choice for service providers who need to deploy low-cost, high-speed dedicated network connections to enterprise customers. xDSL Modems technology enables high speed access through normal, unconditioned copper circuits. Remote Access Servers (RAS) systems are the foundation of the ISP’s business because they ensure that customers dial up when a dedicated connection is either unavailable or unaffordable. 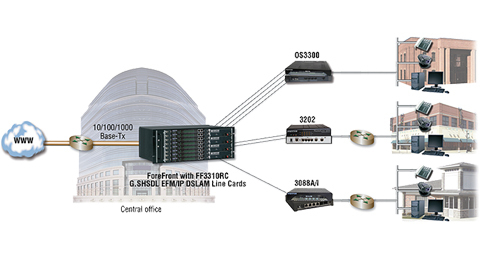 DSLAM delivers high speed broadband for cost-effective, triple-play services, or high-speed private LAN connectivity over existing twisted pair infrastructures. DSLAM is the ideal choice for system integrators, ISPs, and carriers. It is a costeffectivesolution for dedicated Internetservice delivery in situations where thebusiness case does not support the separatedeployment of high-density, chassis based solutions,service creation platforms, and routers.